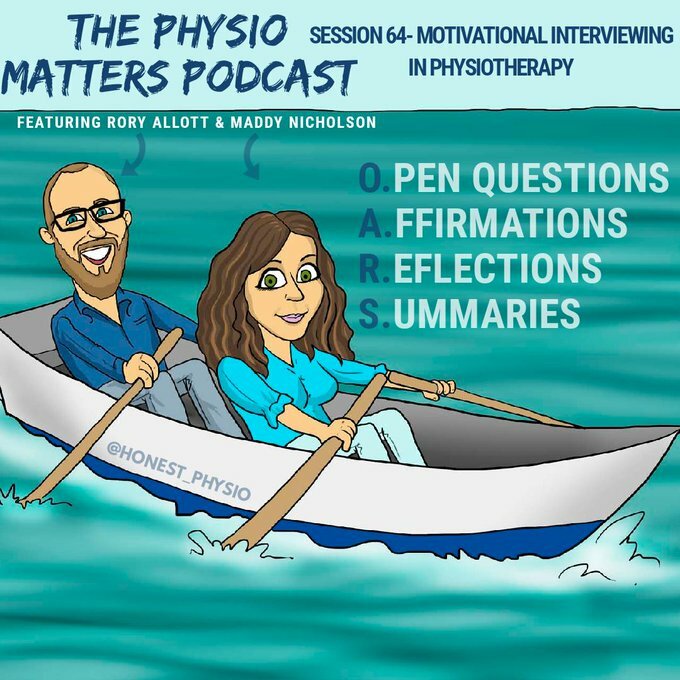 I recently took part in a podcast interview with the sharp minded Jack Chew, Physiotherapist and originator of the popular ‘Physiomatters podcast’ (7th April 2019). I was joined by Maddy Nicholson, a physiotherapist from a North Wales pain team, whom I had trained in MI. She has become a wonderful champion for MI in pain management and physiotherapy. For both of us, the experience was both terrifying and enjoyable in equal parts! Starting with the sound check, Jack reassured us that, although his remit was to ask searching questions and uncover quackery in physiotherapy practise, he wasn’t planning on any swerve balls that might trip us up. Wow! Maybe I’m a little naive, but I hadn’t even considered that a possibility. I went from relatively calm to mildly terrified. Unsurprisingly, for such a popular podcast, it was an easy conversation that flowed and, at times, I hope not to my detriment, I forgot that thousands of people might listen to it, rather than just the three of us in that cosy little room. The podcast begins with us thinking about the origins of MI in the early 1980’s when Prof. William Miller’s sabbatical to Norway focused his mind on writing about what it was he was doing when successfully working with problem drinkers. In his own words, “it was an intuitive approach – something I did without thinking really about why I did it”. How fitting then, that an approach which helps people articulate their own reasons for change, emerged from the questions put to Miller by his own students; “ “Why did you say that?” “Why didn’t you push harder at that point” “Why did you do this instead of that” ” (Miller, 1983). His inaugural article in 1983 outlined the approach and put forward a theory of motivation. Later, Prof. Stephen Rollnick, who’s interests were later focussed on healthcare, met Miller and they worked together on the first book describing MI (Miller and Rollnick, 1991). With the beginnings of MI routed solely in the intuitive practise of one man, it rightly begged the question from Jack as to whether MI had any theoretical basis or evidence? 30 years on from its origins, MI has been beautifully articulated by Miller and Rollnick in two further editions of their original book (Miller and Rollnick, 2002, 2012). These clearly describe the skills; open questions, labelling strengths, and reflective listening, and the ‘spirit’ of MI; emphasising autonomy, joining with patients as partners rather than experts and recipients, and guiding people to articulate their own cherished reasons for change, rather than their worker providing them. With such clarity on what MI is, several tools for measuring whether people are actually delivering it have emerged and there have been numerous trials of its effectiveness. In medical settings alone, Lundahl et al.’s (2013) brilliant metanalysis reviewed 48 trials with just under 10,000 patients. They found that MI is effective at helping “patients exercise more, lose weight, lower HIV viral load, blood pressure and cholesterol, [and] reduce problematic substance use (perhaps even more effectively than in non-medical settings)”. Nearly 30 years on, MI stands as one of the best evidenced behaviour change interventions in the world. A theory of Motivational Interviewing? From its very first description, William Miller has offered a theory of MI. In his first writings, Miller draws a wiring diagram of sorts to offer a theory of motivation. He later, with a little embarrassment, linked this with his grandfather’s interest in electrical circuitory. The metaphor explains that even when people can see the damaging effects of their own behaviour, low self-esteem and/or a lack of belief in their ability to change create a sort of short circuit, rendering people hopeless, believing behaviour change is either impossible or not worthwhile. Change occurs only when a person becomes aware of the dissonance between their health damaging behaviour and what they cherish in life, feel they have the skills to make the change and believe that they, themselves, are worthwhile enough for change to happen. Routed in a wide variety of social psychological theories from Festinger to Bandura that had their own evidence base, the theory was untested and instead a post hoc rationalisation for why MI might be effective. Since then, technical theories have suggested that MI might have its effect by eliciting specific talk from the client about change (Amrehein et al., 2003) and relational theories have suggested that yielding power to patients can create a feeling of safety and act against hard-wired evolutionary processes that create reactance when people feel threatened by the social rank of another (de Almeida Neto, 2017). To a large extent, I believe that all of these theories remain post hoc understandings, that have largely remained untested. Where they have been tested (e.g. Magill et al., 2018), the evidence is not yet strong enough to support any one explanation. Does this matter? I don’t think so. MI is clearly described and is therefore testable in clinical trials. A theoretical understanding of its actions might help to strengthen the approach, but as it stands, a large body of evidence supports its use across a wide range of behaviour change. Might MI lose its potency? And so, to the question that most caught my attention. Is it possible that with such a wide application of MI, and with more and more people exposed to it, might its effectiveness diminish over time? “MI begins with the assumption and honoring of personal autonomy: that people make their own behavioral choices, and that such power of choice cannot be appropriated by another. MI is not a sleight of hand for end-running, outwitting, or hijacking an individual’s motivation. It is about eliciting the person’s own inherent arguments for change, not imposing someone else’s”p132. But still, maybe Jack has a point? As people become more exposed to empathic practitioners who guide them to make their own decisions, maybe they will habituate to that conversation style? Certainly, in the case of Cognitive Behavioural Therapy for depression there has been some evidence of diminishing effectiveness since its inception in the late 1970’s (Johnson and Friborg, 2015). This is not easily explained and might relate to improved trial methodologies, watering down of the method, being applied in ever expanding (and more complex) settings and many other possibilities. But to return to Jack’s original point, will people just become wise to it? Johnson and Friborg (2015) suggest that early successes with new treatments are communicated widely and this contributes to a placebo effect. Later, following increasing awareness amongst staff and patients of varied success, this placebo effect diminishes. This is possible with MI, which was lauded as an effective counterbalance to the confrontative approaches adopted in many US alcohol dependency services. However, unlike CBT, where patients are explicitly socialised to the ‘CBT model’, MI is frequently delivered by clinicians as an opportunistic intervention without being explicitly labelled as MI. The patient is unaware that MI is being delivered and therefore cannot suffer from a diminished placebo effect. The obvious ethical dilemmas related to this are a topic for another time! Johnson and Friborg also suggest that so-called ‘common factors’, such as the alliance between the worker and their patient, might better explain the diminishing effectiveness of novel therapies over time. As greater numbers of inexperienced therapists implement novel therapies over time their effectiveness diminishes because the relationships these therapists form are poorer. Empathy and alliance frequently account for over 3 times the variation in outcomes as compared to specific therapeutic techniques, such as those used in CBT (Wampold, 2015). In pain management, higher empathy expressed by doctors independently predicts a better quality of life and lower pain intensity reported by patients (Canovas et al., 2018). This is the strength of Motivational Interviewing. It was built around these very same common factors; empathy, collaboration, improving alliance. Moreover, it brilliantly articulates for the practitioner what they need to listen for and in what ways they should respond to strengthen these common factors. In doing so, MI might be more resilient to it losing its potency over time, which is maybe the reason for its continuing popularity nearly 30 years on from its first description. Amrehein, P.C. et al. (2003). Client commitment language during motivational interviewing predicts drug use outcomes. Journal of Consulting and Clinical Psychology. 71(5):862-78.
de Almeida Neto, A.C. (2017). Understanding Motivational Interviewing: an Evolutionary Perspective. Evolutionary Psychological Science 3 (4), 379-389. Canovas et al. (2018). Impact of Empathy in the Patient-Doctor Relationship on Chronic Pain Relief and Quality of Life: A Prospective Study in Spanish Pain Clinics. Pain Medicine. 19(7):1304-1314. Johnson, T. J. and Friborg, O. (2015) The Effects of Cognitive Behavioral Therapy as anAnti-Depressive Treatment is Falling: A Meta-Analysis. Psychological Bulletin, 141(4):747-68. Magill, M et al. (2018). A Meta-Analysis of Motivational Interviewing Process: Technical, Relational, and Conditional Process Models of Change. Journal of Consulting and Clinical Psychology. 86(2): 140–157. Helping People Change. New York: Guilford Press. Preparing People for Change. New York: Guilford Press. Preparing People to Change Addictive Behaviours. New York: Guilford Press. Wampold, B. (2011). How important are the common factors in psychotherapy? An update. World Psychiatry 86(3):359-64.